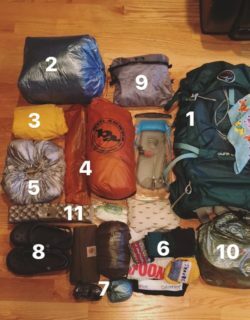 WHAT: My first backpacking trip. WHERE: Friday night we are meeting at the Osceola Vista campground and then I am guessing we are getting in cars Saturday morning to get to the Flume Visitor Center where we will park our cars near the Liberty Springs trail head. We will then hike up the AT a.k.a. Liberty Springs Trail to the Liberty Springs Campsite, a spot known well by AT hikers. From there, we will hit Mt. Liberty and Mt. Flume via the Franconia Ridge Trail. Sunday, we will descend back down the Liberty Springs trail. WHEN: June 2-4, 2017. per AMC leaders, this weekend is notoriously rainy. I say bring it on. I want an excuse to test out my zpacks rain kilt. 6. Sleeping Clothes – tights, long sleeve t-shirt, thick wool socks, compression socks, hat and an extra pair of hiking socks. Hiking Clothes (not pictured) – Injinji Liner Toe Socks, Darn Tough Wool Socks, Altra Lone Peak 3.0 (waterproof) trail runners, spandex tights, sports bra, exofficio underwear, synthetic tshirt, and buff. 10. 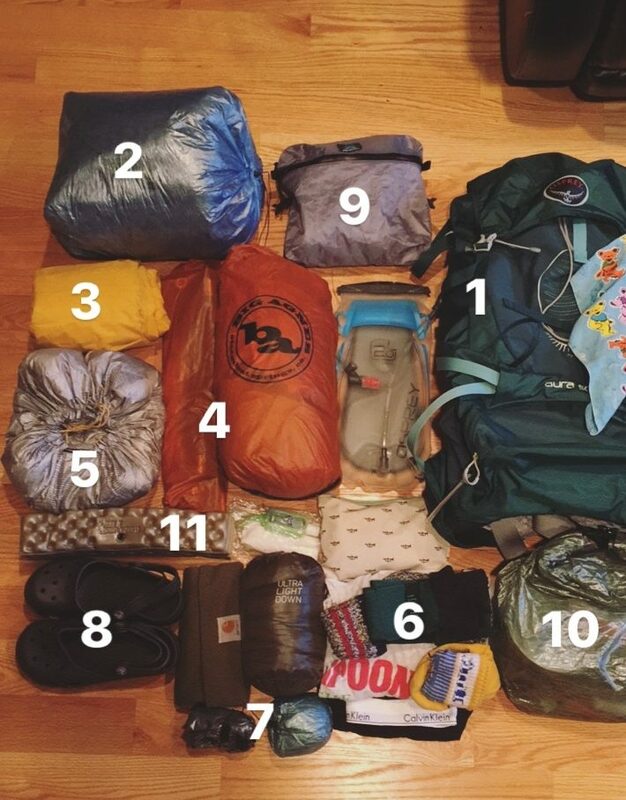 Kitchen – cheap-o stove + fuel, cheap-o pot, spork, Sawyer squeeze + dirty water bag, smart water bottle, snacks + food all stored in a zpacks roll top food bag from their bear bagging kit, lighter. 11. Comfort – Thermarest Zseat, Thermarest NeoAir Mini Pump, charged iPad (not pictured), iPhone headphones, iPhone, external battery + cord, sunglasses, contact solution + glasses, toothbrush (my friend Marissa gave me a couple toothbrushes with toothpaste pre-applied – can’t wait to try this out! ), Dr. Bonners, extra bandanna, pocket knife, small amount of Picardin and sunscreen to reapply, bathroom kit with antibacterial, whistle, and small first aid kit. my name is emily and i am a future AT thru-hiker. i like the grateful dead, board games, and sandwiches. if all goes as planned, i will be hiking the AT NOBO in 2020. check here for posts about my inevitable changes in gear, shakedown and mini section hikes, and other miscellaneous ramblings of a beginner backpacker. Hope you have a great time! But…. maybe ditch the ipad 😉 What do you plan to use it for that you can’t use your phone?